Oriental Orthodox Churches: 10000 Catholics and Anglicans joined Syriac Orthodox Church in Brazil. 10000 Catholics and Anglicans joined Syriac Orthodox Church in Brazil. 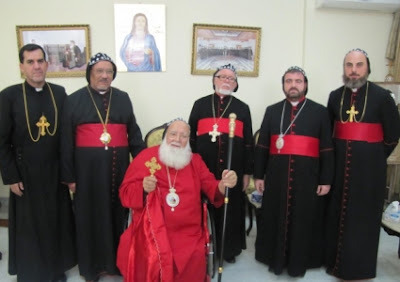 The Syriac Orthodox Church has about 100 000 new members in Brazil. It's about Portuguese people who were previously Catholics and Anglicans, who found his spiritual home in the Syriac Orthodox Church. His Holiness the Patriarch approved and blessed 2 bishops and 2 priests who represented around, 80 priests and more than 100,000 believers who joined in the Syriac Orthodox Church Community. The official request was submitted to His Holiness around 2 years ago and since then they were working for the Church's development in Brazil. The two Syrian Orthodox bishops called Jolino Gomes Neto (Archbishop) and Jose Faustino Filho and 2 priests, are now in the Patriarchate. They met with His Holiness before His Holiness’s departure to Cairo and discussed the church's growth in Brazil and other related matters. Mor Silvanus Peter Al-Nehm, Metroploitan of Homs and Hama and Mor Philoxenus Mattias Nayis, Patriarchal assistant were present during the discussions. Holy Father decorated Father Flavio Tadeusz with Golden Cross and Chain. why you gave Indian Orthodox church as a seperate church... Indian Orthodox church is a division of and an integral part of Syriac Orthodox Church.. The primate of Indian Orthodox Church(Malankara sabha) is H.H Patriarch of Antioch and all the East.. Our present patriarch is H.H Ignatios Zakka Iwas 1st.. I heard about this now and that makes me very proud to have brothers and sisters in faith all over the world. God bless als syriac orthodox all over the world.